Want a simple, convenient piece of plastic that won’t cost an arm and a leg? Not really interested in complicated rewards schemes and counting points? Occasionally miss a monthly payment (or two)? What is a low rate credit card? When we talk about a low rate credit card, it usually means one that comes with a purchase rate below 15% attached. This might not sound particularly low - after all, you might be only earning around 2-3% interest on your savings account - but when some pieces of plastic pack interest rates as high as 21.99%, it is a pretty good deal. Besides, if you’re really lucky and do your research, you can even snag a rate as low as 8.99%. Now we’re talking! What types of low rate cards are available? Standard low rate - This is your basic low rate credit card. It’s good for convenient spending that’s gentle on your budget, but doesn’t usually come with many bells or whistles. Don’t expect any fancy rewards schemes or perks with this card. Premium low rate cards - Gold and platinum cards with low rates are not common, but if you’re after a few extra perks and a decent rewards system it might be worth the search. Low interest with a 0% intro offer - These cards come with absolutely no interest for a certain period - which is awfully tempting, but for this to be a really good deal, make sure it reverts back to a low rate when the offer is finished. Low interest with a balance transfer option - If you’re trying to pay down debt, you might opt for a card with a 0% balance transfer period. This will give you some breathing room to get your balance under control, but make sure this piece of plastic will revert to a low rate when the BT period runs out. Ready to compare low rate cards? Check out the table below or scroll down for more info on why low rates are so important and what to look for in a low rate card. Why is a low rate so important? If you use your credit card responsibly and make use of your interest free days, you never even have to worry about paying interest. And with the option to set up direct debit payments to cover your bill, keeping on top of a credit car balance has never been easier. So why is it so important to snag a low rate card? Think of it as a safety net - if there’s an emergency, if something goes wrong, or if you just plain forget and wind up missing a payment or two, a low interest rate means it won’t be the end of the world. It might be a bit of a pain - who wants to pay interest when they don’t have to? - but it’s way less likely to break your bank. So if you’re the kind of person to occasionally let your balance roll over, a low rate card might just be your new best friend. Nothing’s perfect right? A low rate card is a great piece of plastic to have in your pocket, but here’s the catch: it’s pretty basic. If you’re after perks or rewards, you’ll want to look elsewhere, because most low rate cards are designed for convenient, budget-friendly spending - and that’s about it. If you are interested in all the freebies and perks a credit card can offer, you may have to compromise by going for one with a slightly higher interest rate. But don’t worry - that just means you need to use your card right and pay off your entire balance to avoid getting hit by interest at all. What else should I look for in a low rate credit card? Low fee. 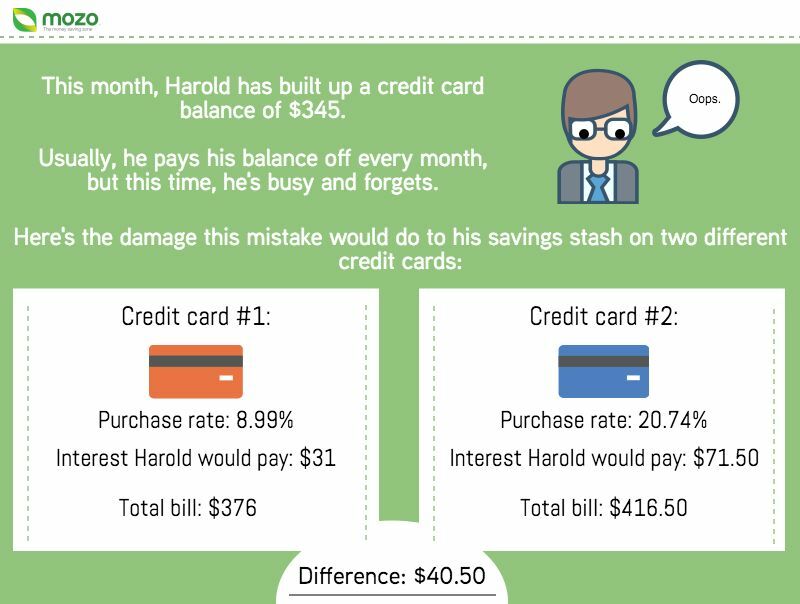 If you’re saving all this money by picking a credit card with a low interest rate, why ruin all your good work by forking out for a high annual fee? There are plenty of options designed to be cost-effective, with both low rates and low fees, so opt for one of these cards. Rewards options. There are less rewards options on offer when you opt for a low rate card, but if you’re a rewards fiend, don't give up just yet. Premium low rate cards with rewards schemes attached do exist, and you can snag things like gift vouchers, retail discounts and even flights. Introductory offers. How does 0% interest sound? If you snag a great introductory offer on your credit card, you could pay absolutely no interest for months! Just a few things to remember: most lenders will require you to pay at least the minimum each month to keep your 0% interest rate, you should make sure that when the offer is finished you’ll revert to a nice low interest rate, and be sure to pay off the balance in full before the 0% interest period ends - any amount left on your account will attract interest! Low cash advance costs. As a general rule withdrawing with a credit card from an ATM should be avoided, but if you do find yourself in a spot, you'll be glad you selected a card that comes with a reasonably low cash advance rate. The first is called the purchase rate and is the rate you’ll be charged on regular spending, like shopping, eating out or paying bills with your credit card. It’s only charged once your interest free days have run out. The other one is called the cash advance rate, and is applied when you visit the ATM with your credit card in hand. This rate can be a lot higher than the purchase rate and is also charged immediately - interest free days don’t apply. What are interest free days and how do they work? 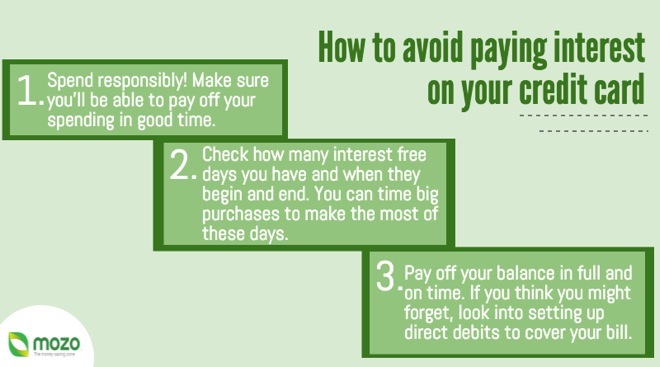 Interest free days are one of the best ways to make sure your credit card is a convenience and not a huge money drain. You’ll usually get a period of 44 or 55 days, depending on what card you opt for, during which you won’t pay any interest on your purchases. and you bought a new camera on May 25, you’d have only 19 interest free days left to pay off your purchase. If you bought it at the start of the month, you’d have the full 44 days to pay it off before getting hit with interest. In order to keep your interest free days, you’ll need to pay your bill off in full each month. If one month you don’t pay off your balance or only pay the minimum you need to, then you'll lose your interest free days for the next month. From there, it’s a slippery slope leading to a massive credit card bill. How can I find a low rate credit card? Ready to put a piece of plastic in your pocket? Head over to our low rate credit card comparison table to browse through your options. Or if you’d like to see a list of credit cards tailored to your needs, take our credit card search tool for a spin.